CORFU DISCOVERY TOURS - with Australian artist Warren Curry - The Tour of Corfu. Join Australian artist Warren Curry on a discovery tour to the Greek Island paradise of Corfu. Tours depart reguarly from Australia, or may be joined in Athens or Corfu. The tours are aimed at artists of all levels, and include tutelage and critique sessions by choice. Because of the cultural interests shown by the particpants, non-artists are most welcome to join the tours and enjoy the hospitality of the Corfu people and the beauty of the island. Accommodation is at the magnificent Levant Hotel on the summit of a hill overlooking the village of Pelekas. The panoramic views are stunning, and the sunsets offer a golden tranquility to end the day. Built in neo-classical style the hotel offers twenty-five romantically decorated rooms all with a view, spacious bathroom, TV and mini bar. It also boasts a lounge, caf?, swimming pool and an extensive terrace overlooking the Ionian Sea. Their will be times when you will prefer not to leave the hotel. Well, thats up to you, for the whole idea of the tour is to relax and enjoy at your own pace. Tour costs and dates: Please apply. The tour duration is generally sixteen days, with fourteen nights on Corfu. Tours are limited to a maximum of fifteen participants. * one day cruise to the islands of Paxos and Anti Paxi, and the mainland port of Parga - cost generally $60 per person. * enjoy a fascinating one day tour to Albania - cost generally $100 per person which includes the ferry, bus tour and meal. * another superb cruise to the island of Kefalonia - cost generally $90 per person. Of course, other tours are available to suit your needs. We recommend that you budget for at least the day cruise to Paxos and the Greek taverna night as most tour members participate in these. Contact Warren Curry direct for further information and Booking Form. 69 Tarraville Road, Port Albert, Victoria 3971, Australia. Phone/fax: Within Australia: 03 5183 2588. It is important to stress that the tours are not restricted to artists. 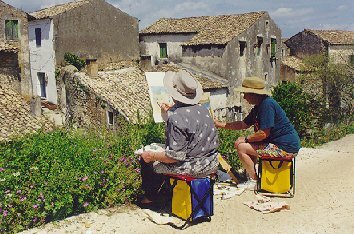 The places visited by the artists, such as the many villages, inland countryside and seaside, all have interest for the non-artist. 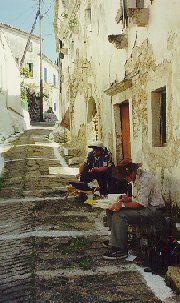 (Indeed, on the arrival at some villages, many artists prefer to occasionally wander around and enjoy the ambience of the tavernas and markets). 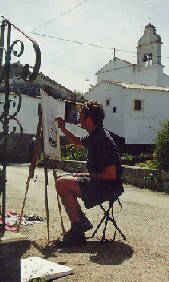 Non-artists are free to 'do their own thing', and may prefer on occasions not to join a day trip with the group. Joining in with artists however extends the cultural experience of the tour and an appreciation of the beauty of the island, and the hospitality of the people. Artists will probably bring their own materials, although there is an excellent art supply shop in Corfu township; discuss this with Warren Curry. Curry Studios Pty Ltd, ACN (ACN 005 747 179). Optional tours may be prepaid, or arranged on the island. Tour cost does not include departure taxes, personal spending, beverages other than as arranged with meals, tips and gratuities. Original artwork copyright W.Curry. Curry Studios Homepage.